Long John Silver's will be celebrating "Talk Like A Pirate" day again tomorrow, September 19. The chain is inviting customers to join the pirate fun by celebrating the 'holiday.' The restaurant is named for the pirate in Robert Lewis Stevenson's classic book Treasure Island. Kids and adults alike can get their own pirate hat when they visit a Long John Silver's restaurant tomorrow. 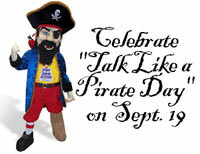 Talk Like a Pirate Day began in 1995 when creators Mark Summers and John Baur were playing racquetball in Albany, Ore. When one player reached for a tough shot, he exclaimed, “Aaaaarrrr!” Spontaneously, the two began speaking in pirate jargon, complete with accents, and the idea was born. The day is now an annual tradition and the light-hearted pirate fun has caught on with the media.